The designers have styled the office in what they consider the “hottest design trend for the future” – ‘up-cycling’ waste material and ‘re-cycling’ old furniture after giving them a facelift. The sustainable theme of the office extends from cement walls and flooring to leftover fabrics and recycled designer pieces. Plastic blue wrapping redecorates designer chairs and fabric samples sourced from suppliers adorn a meeting room sofa. Opting for an unconventional meeting and presentation room instead of a traditional “conference room”, chairs are redecorated with thick black elastic bands, plastic straps and greenhouse sun-screen netting. Next to the chairs is a cluster of tables, which allows different combinations, providing flexibility and easy adaptation for different use. This set-up allows clients or meeting attendees to seat themselves in a relaxed and comfortable way simulating a café when they are listening to a presentation or participating in a meeting. Floors as well as the low partition walls and worktops are raw concrete to allow free space for creativity. It also extends to original concrete walls whose existing paint has been taken off. Old closets once destined for the dump proudly show their age with washed-away paint and weathered scratches. New metal shelves were only varnished to prevent rusting – yet their original rough edges are deliberately retained. The grungy ‘junkyard’ concept is designed to demonstrate the potential of putting waste material to stylish use. Sustainability is the hottest topic around the world these days and the trend is reflected in designs for the future. Their eco-commitment even extends to lighting. Randomly hanging chandeliers are, in fact, LED lit, brightening gradually when they are switched on. Adjustable, flexible track lights are similarly energy-saving. The project finished in February 2013 in Hong Kong. Their eco-commitment even extends to lighting. Randomly hanging chandeliers are, in fact, LED lit, brightening gradually when they are switched on. 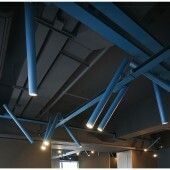 Adjustable, flexible track lights are similarly energy-saving. Randomly hanging chandeliers are, in fact, LED lit, brightening gradually when they are switched on. Adjustable, flexible track lights are similarly energy-saving. Client Objectives and program: Being a design firm, the client wants to bring in a sense of rawness into the office design. He wants to make sure that whoever enter the office, could immediately tell it’s a design firm, having an unconventional office design. 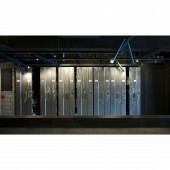 The office should have its own style, look kind of disorderly yet present a strong creative vibe. In addition, he’s an environmentalist who cares about the nature, thus suggested the design should present a subtlety of environmental consciousness. How our design achieved the client objectives: The designers consider doing something out of the box – ‘up-cycling’ waste material and‘re-cycling’ old furniture. It’s not a popular renovation method yet, but the designers believe ‘up-cycling’ and‘re-cycling’ will be the ‘hottest design trend for the future’. The sustainable theme of the design house extends from cement walls and flooring to leftover fabrics and recycled designer pieces. Chairs are redecorated with thick black elastic bands, plastic straps and greenhouse sun-screen netting. Plastic blue wrapping redecorates designer chairs and fabric samples sourced from suppliers adorn a meeting room sofa. Floors as well as the low partition walls and worktops are raw concrete to allow free space for creativity. It also extends to original concrete walls whose existing paint has been taken off. Old closets once destined for the dump proudly show their age with washed-away paint and weathered scratches. Their eco-commitment even extends to lighting. Randomly hanging chandeliers are, in fact, LED lit, brightening gradually when they are switched on. Adjustable, flexible track lights are similarly energy-saving. One Plus Partnership Limited Office Office by Ajax Law & Virginia Lung is a Nominee in Interior Space and Exhibition Design Category. One Plus Partnership Limited Office Office by Ajax Law & Virginia Lung is Winner in Interior Space and Exhibition Design Category, 2013 - 2014. Did you like One Plus Partnership Limited Office Office? Help us create a global awareness for good interior design worldwide. Show your support for Ajax Law & Virginia Lung, the creator of great interior design by gifting them a nomination ticket so that we could promote more of their great interior designs.